If you're in the market for a bigger-than-average phone, then Google just gave you something new to think about in the form of the Pixel XL, its brand new 5.5-inch handset unveiled today in San Francisco, which is packed with plenty of Google magic. 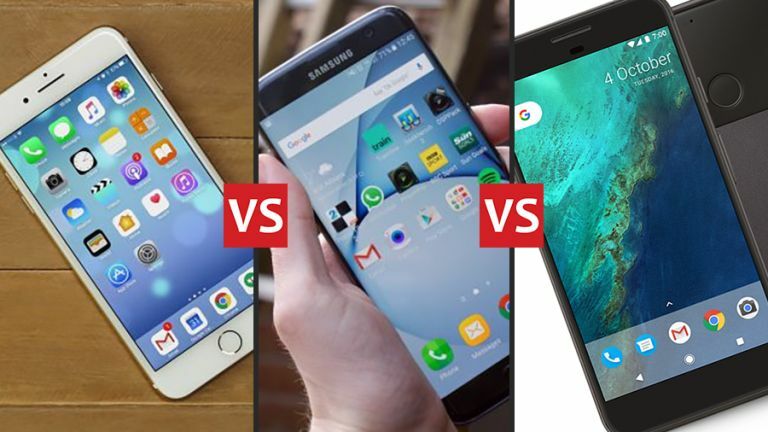 Here we're going to put it up against the current kings of the category, the iPhone 7 Plus from Apple and the Galaxy S7 Edge from Samsung (we would've included the Note 7, but it's been having problems...). So which over-sized phone is most deserving of your cash? With most of today's high-end phones rocking similar internal specs, design remains a crucial part of any smartphone head-to-head. Of course, beauty is in the eye of the beholder, but if you want our opinions then we're happy to share them. These are three fantastic-looking phones, first and foremost. The iPhone 7 Plus has a classic, iconic, Apple-y look. The Pixel XL looks better than we thought it would, and builds on the good work HTC has been doing with the HTC A9 and HTC 10. If we had to pick a winner, though, we'd go for the Samsung Galaxy S7 Edge: those curved sides are really coming into their own, despite appearing rather gimmicky at first. We wouldn't be surprised to see other companies copying Samsung's lead here, once they've got over the embarrassment of having to copy Samsung. There's not much in it but the S7 Edge gets our vote, helped by that gorgeously bright and responsive, high-resolution AMOLED screen that ensures everything from movies to websites really pop out from the phone. Internal horsepower, number of pixels, storage space... there's a lot to consider when picking a handset. And these three deliver in spades. Google's new Pixel XL features a Snapdragon 821 processor, 4GB of RAM and either 32GB or 128GB of internal storage. The 5.5-inch AMOLED display runs at a resolution of 1440 x 2560 pixels, roughly 534 ppi. The iPhone 7 Plus packs Apple's super-fast A10 processor, 3GB of RAM and your choice of 32GB, 128GB or 256GB of internal storage. The 5.5-inch screen has a resolution of 1080 x 1920 pixels (about 401 ppi). The S7 Edge matches the display size of the iPhone 7 Plus but ups the resolution to 1440 x 2560 pixels (about 534 ppi). It packs either a quad-core Snapdragon 820 or an octa-core Exynos 8890 processor, depending on where in the world you live, and has 4GB of RAM. 32GB and 64GB are the storage choices. So - take your pick. On paper they're hard to separate, though benchmarks suggest the iPhone 7 Plus wins in terms of raw power, even if Google and Samsung have the edge with display resolution. We'll have to wait to get our hands on the Pixel XL to see just how well it performs. The camera is always a big part of any smartphone purchase and the iPhone 7 Plus (with its 2x optical zoom) and the Samsung Galaxy S7 Edge (with its excellent low-light performance) have already been wowing users. Google says the 12.3-megapixel camera on the Pixel XL is better than both of those - apparently it's the best smartphone camera ever, and the experts at DxOMark agree. Again, we'll have to wait and try it for ourselves, but those are bold claims. The jury's still out on battery life as well. The Pixel XL packs a 3450 mAh battery that Google insists is good for 14 hours of video, but let's wait and see. It's certainly going to last you longer than the smaller Pixel we reckon. One disappointing omission from the Pixel XL is waterproofing, available on both the iPhone 7 Plus and the Samsung Galaxy S7 Edge but absent on Google's phone. You do however get the AI-powered goodness of the Google Assistant, the next-gen version of Google Now. Would you rather have your phone survive a drop in the pond? Or be able to take advantage of Google's AI assistant? The choice is yours. Oh, and there's the whole iOS vs Android thing - but we'd need another article or five to get into that here. Price has a funny effect on phones, because you can have the best features in the world, but if they're beyond the scope of your wallet, they're completely irrelevant. Likewise a rather so-so phone can suddenly look great value at a low price. Low prices are certainly not what you get with the iPhone 7 Plus. SIM-free and unlocked, prices start at £719 (or $769) and go all the way up to £919 ($969) depending how much storage you want. Getting a fixed price for the Samsung Galaxy S7 Edge is harder but it's listed on Samsung's own site for £639 (32GB) or $769 (32GB) SIM-free and unlocked. And so to the Google Pixel XL, which is available to pre-order for £719 (or $769) for the 32GB model and £819 (or $869) for the 128GB model. It's perhaps no surprise that those prices match up very closely with Apple's and Samsung's. The good news for the smartphone buyers out there is that these are three excellent phones, if you've got the cash to afford them. Decide which features matter most to you, and take your pick accordingly.